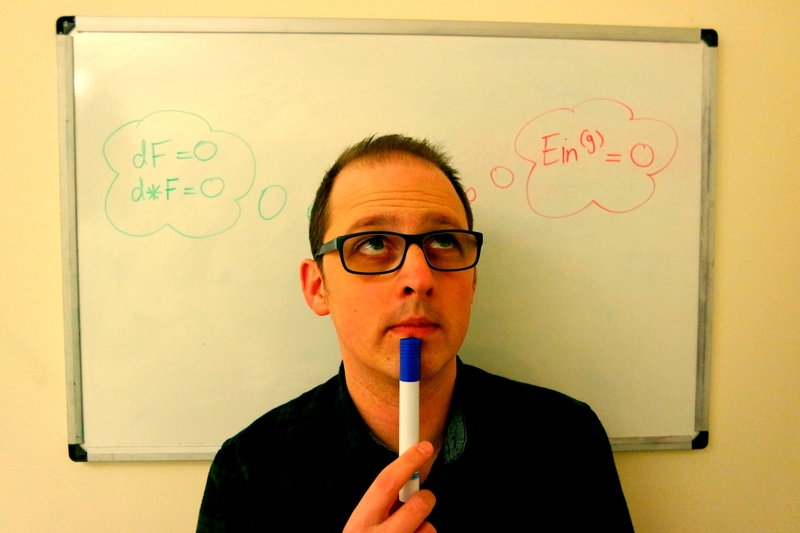 Timothy J. Walton occupies some quantum state between a physicist and a mathematician, having obtained his PhD from the physics department at Lancaster University in 2008 but now masquerading as a lecturer in mathematics at the University of Bolton. As I recall, this question was posed and began to take root during one of the regular meetings I have with Robin. Within my institution, I am fortunate enough to be able to put aside a whole day from my teaching responsibilities to concentrate solely on research – indeed it is actively encouraged in order to supplement our teaching as part of the University of Bolton’s “Teaching Intensive Research Informed” agenda. Meeting once a week leads to a very focussed and intense day of work – invariably devoted to a specific problem we are trying to overcome – but allows plenty of time between such sessions for our own individual ideas to form and breathe; this certainly compliments my way of working. It was during lunch – customarily a time of much discussion where all sorts of ideas are bounced around – that Robin, noting the similarity in structure between the linearised Einstein vacuum equations (LEVE) and the vacuum source-free Maxwell equations, wondered whether we could apply the techniques developed to construct pulsed electromagnetic waves to the LEVE. We had seen that in the Maxwell source-free sector, any solution to the four-dimensional scalar wave equation could be used to construct a Maxwell solution. Using a simple class of exact solutions (found by Ziolkowski  following work by Synge  and Brittingham ) to that equation, we then generated Maxwell solutions with finite total energy and electromagnetic fields bounded in all three spatial directions, perfect for modelling short pulses of laser light. But could a solution to the scalar wave equation in spacetime be used to generate a linearised Einstein vacuum solution? This question and its possible consequences renewed our enthusiasm and we rushed back to our computers. The solutions to the LEVE, perturbations of Ricci-flat spacetimes, involve a trace-free, divergence-free, real covariant symmetric rank-two tensor that solves a particular tensor Laplacian equation. Using the Ziolkowski solution to the scalar wave equation, it was straightforward to construct a real covariant symmetric rank-two tensor. Remarkably, after just a few minutes of coding using our own bespoke differential geometry package “Manifolds”, written for the MAPLE operating system, we showed that this tensor was indeed a solution to the LEVE system – we were both quite amazed! In no time at all we were able to use this method to construct a solution to the LEVE using any solution to the scalar wave equation – this result alone I still find rather remarkable! We decided it would be interesting to further investigate properties of the linearised metric related to the Ziolkowski scalar field and the associated proper-time parametrised time-like spacetime geodesics. This is the main focus of our latest article published in CQG  where the construction outlined above yields the spatially compact pulsed gravitational waves we had first conjectured. After the initial highs of finding the pulsed solution followed the relative lows of finding a suitable method to numerically solve the associated geodesic equation for the motion of a massive test particle in a pulsed gravitational field. This process was subtle and time-consuming, but led us to question further what is meant by a perturbation of flat spacetime, since we discovered solutions where the metric perturbations were “small” in regions of spacetime where the associated curvature perturbations were not. This led to a further constraint on our analysis which we fed into our numerical code, thus ensuring that our solutions always remained within a truly perturbative domain. The details can be found in . To explore the physical interpretation of our solutions, we applied them to the long standing problem of the origin of astrophysical jets: highly energetic charged particles focussed by rotating objects at the centre of some galaxies into jets of radiation along their axes of rotation. Using suitably arranged massive test particles to emulate a thick accretion disc, we analysed the geodesics associated with pulsed gravitational perturbations of flat spacetime. We were able to generate both uni-directional and bi-directional jet structures with well-defined dimensionless aspect ratios, suggesting that such pulse-like perturbations may offer a non-Newtonian gravitational mechanism for the initialisation of a dynamic process leading to astrophysical jet structures. This entry was posted in Author Insights, IOPselect and tagged accretion, gravitational fields, gravitational waves, spacetime by Jennifer Sanders. Bookmark the permalink.